Bruce Pauling* B.V.Sc., Director, Professional Veterinary Distributors Ltd., Titirangi, New Zealand & Richard Tiddy B.V.Sc., M.Sc., Vet Resource, Te Awamutu, New Zealand. Aim: A double blind trial to examine whether a commercial electrolyte with added β-cyclodextrin will improve the rate of recovery of diarrhoea from natural field infections of Cryptosporidium parvum in a commercial calf rearing unit. Background: Calves affected with cryptosporidiosis diarrhoea are reported to exhibit clinical signs typically lasting 7 days or more (Fayer et al 1998; Castro-Hermida et al 2002). Farmers offer supportive fluid replacement therapy until the calves start to improve. β-Cyclodextrin activity against Cryptosporidium parvum has been reported in vitro and in vivo in a range of species including mice, lambs, and calves (Castro-Hermida et al, 2000-2004). On many calf units infections are complicated with significant death rates attributed to mixed infections. β-Cyclodextrin is reported as ‘virtually tasteless’ and should be readily palatable to a young calf with reduced appetite. Hypothesis: Diarrhoeic, dehydrated calves with cryptosporidiosis when treated with an electrolyte supplemented with betacyclodextrin will have an improved rate of recovery compared with a non-supplemented electrolyte. It was proposed that the improved rate of recovery will be measured with an earlier return of appetite and a reduced volume of electrolyte to reach full recovery onto a full milk diet. Materials: Two electrolyte formulations were prepared, one a commercial isotonic electrolyte (“Enervade™”) with soluble dietary fibre (resistant maltodextrin) added (Ep) and the second being an identical electrolyte mix to which 10 gm betacyclodextrin was also added (EpBCD). Method: A commercial calf unit raising 1600 Jersey/Friesian cross calves per year with a history of cryptosporidial diarrhoea presented 25 simultaneously diarrhoeic calves for the study. The presence of cryptosporidial oocysts was confirmed in cases prior to the trial, in subsamples of enrolled calves, and sentinel calves were also monitored to a limited extent for cryptosporidial oocysts and other pathogens associated with neonatal calf diarrhoea. The calves were typically aged 6 – 12 days of age, and weighed 24-32 kg. Treatments were blinded to both the herd manager and trial monitor and randomised. Following assignment, calves were placed alternately into one of two adjacent hospital pens and fed from communal electrolyte/milk feeders. Treatment started by withholding milk for 24 hours. Calves in each pen were then offered one of either electrolyte treatments at least twice daily for 24 hours according to “demand” (ie consumption rate). 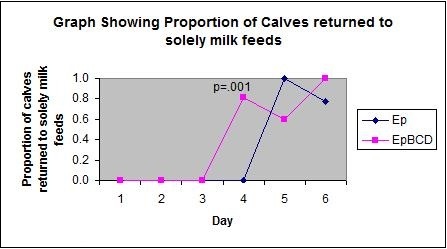 Calves were then offered milk twice daily to assess the return of appetite, and were fed milk if they desired, otherwise electrolyte was continued. Each group continued to receive the assigned electrolyte at least once daily over a three day period. Voluntary electrolyte consumption was encouraged. Results: Cryptosporidiosis was confirmed among affected diarrhoeic calves. 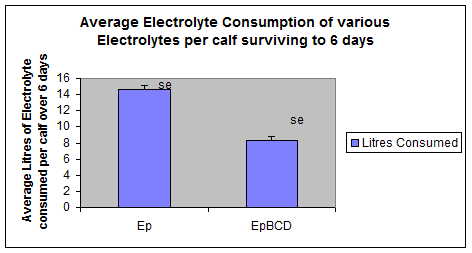 Calves treated with β-cyclodextrin electrolyte (EpBCD) recovered their appetite more quickly than the control electrolyte (Ep) (P < 0.001), and the total electrolyte volume required was significantly lower in the EpBCD formulation – 33% less on day 5, (95% CI 25-40%) . Relapse diarrhoea cases occurred in each group following the re-introduction of milk. Legend Ep – Commercial electrolyte without β-cyclodextrin. EpBCD – commercial electrolyte with β-cyclodextrin.. Death rates were 5/13 in Ep electrolyte, and 3/12 in the EpBCD group being typical of the death rates on the property for this type of case. 1. A significant increase in the rate of recovery of appetite in the group of calves treated with the electrolyte formulation containing betacyclodextrin compared with the control electrolyte formulation. 2. A significant (33%) reduction in the total volume of electrolyte used in the time to full calf recovery onto a milk diet. 3. No significant difference in death rates between treatment groups, however numbers were low and numerically, fewer EpBCD affected calved died. Pauling, B.”A field report to compare the responses in calves with diarrhoea associated with cryptosporidiosis when treated with electrolytes with or without beta-cyclodextrin.” Proceedings of the XVI Congress of the Mediterranean Federation for Health and Production of Ruminants, Zadar, Croatia, 26 April 2008.. University of Zagreb, Faculty of Veterinary Medicine, 2008.